Perhaps the question I am confronted with most when teaching statistics courses to psychology undergrads is “Why should I need this, when I become a therapist”? That’s a difficult one to answer in a single sentence, but I will give it a try, nonetheless: “Because everything we know in psychology - and the social sciences in general - is connected to empirical data”. Well, it was a first try. As the previous sections of this volume have shown you, in scientific psychology we strive to test our claims using data. Testing our claims (ideally) leads to appropriate theories becoming successful and inappropriate theories being discarded. When you are working with patients or clients, would you not rather use techniques that have been proven to be successful in reducing negative symptoms? Even more baffling to many of you, now reading these words, is the idea of learning a programming language like R in the first year of studying psychology. But the same reasons for learning statistics in general apply to learning R. To move from observations to conclusions requires multiple steps: encoding observations in data, organizing data, describing data, and testing hypotheses using data. The previous section showed you how to collect data in experimental settings using Python. In this and the following sections we will try to turn the data we gathered into conclusions about our hypotheses by using R - a multi-purpose tool that can be used for almost anything data-related. This is the obvious one: R costs you nothing to obtain or use. A lot of other software for data analysis requires you to either buy a specific version or rent a yearly license. R, on the other hand, you can simply download, install, and use. R is developed and maintained by `non-profit foundation<https://www.r-project.org/foundation/>`_, meaning it is free of commercial interests. Yes, I’ve said this already, but this time it has a different meaning. This “free” pertains to the `definition of free software as proposed by GNU<https://www.gnu.org/philosophy/free-sw.en.html>`_, which can be boiled down to the phrase “the users have the freedom to run, copy, distribute, study, change and improve the software”. This means that R is an open source software and this applies not only to the R-core itself, but also to the packages, which you can obtain via the official repository. This allows everyone to see what is actually happening - e.g. which formulas are used to compute statistics - and catch mistakes in the software before you publish research that is flawed (see [Eklund2016] for what may happen, when software is not open for such checks). One important aspect of doing research is using the correct tools. Correct is often understood to simply mean “not wrong”, but in science there is a lot of nuance to “not wrong”. Some approaches may simply become outdated, because newer alternatives are available or because someone has developed an adapted version which is better suited for your specific case. Currently, many new methodological developments are implemented as R packages and made available for anyone to use. Commercial software is often slower to react, because there is not enough demand for the approach you might need, in order to implement it into a specific software. Thus, R is a more direct channel to current developments in analysis tools. To be able to use newly developed analysis tools comes with a few caveats, of course, because you lose the vetting process performed by commercial providers. A lot of software is limited to what has been implemented by the developers. This is where R can really shine, because it allows you to implement whatever analysis you want, as long as you are able to formulate it in the R language. Because the most basic building blocks of R are simply mathematical operations and relations there is almost no limit to what you can implement. Be aware, that this does not mean that R is the best tool to implement whatever it is, you’re trying to implement; it simply means it is a tool that makes it possible at least. There are hundreds of resources and websites containing tutorials, guides, comparisons of approaches, and assistance. Of course, R comes with help-files and examples and there is `an extensive list of FAQs<https://cran.r-project.org/doc/FAQ/R-FAQ.html>`_, but as is the case with most programming languages, the premier resource for specific questions is `stack overflow<https://stackoverflow.com/>`_. As I am writing this, there are currently 278380 questions tagged “R” on stack overflow, most of them with well-meaning, detailed responses. But before we can get to experts’ opinions on stack overflow, there are some additional resources you can check, if the presentation in this volume leaves you with open questions. Maybe one of the websites that is visited most often in the early stages of learning R is the `Quick-R website by DataCamp<https://www.statmethods.net/>`_, where you will get quick answers to some of the early questions in an alternative way to our presentation here. Another way you may want to try to learn the first steps of R is through online courses like `Harvard's "Statistics and R"<https://online-learning.harvard.edu/course/statistics-and-r>`_ or `DataCamp's interactive "Introduction to R"<https://www.datacamp.com/courses/free-introduction-to-r>`_. There are also a lot of other courses out there, most of which are not free, however. Our hope is, of course, that you will be in no need for such resources once you are done with this and the following sections, but it cannot hurt to have alternatives. As, no doubt, your parents have told you on multiple occasions, this is perhaps the single worst argument on the planet to do something: “Would you jump off a bridge, if your friends did it?” Well, in this case, you might want to, because one of the core necessities for open and reproducible science is communicating your work. Not just results and conclusions, but also how you got there. As I stated above, R can be used for basically all steps between assessing data and producing manuscripts and if others use it, it may be necessary for you to be able to read what they wrote, to gain an understanding of how they structured, analyzed, and visualized their data. On the other hand, writing R code also allows other people to retrace the steps you took, because many people can read it. In 2017, Python and R were among the fastest growing programming languages - measured by the number of Stackoverflow views of questions tagged for either one of those languages ([Robinson2017a], [Robinson2017b]). On `Bob Muenchen's Website r4stats<http://r4stats.com/>`_ you will find a continuously updated Article with current numbers on the popularity of R ([Muenchen2019]), where it is among the most sought after skills in job descriptions and the second most common software cited in scientific articles. The best way to get R is to simply grab it directly from its provider. R itself and most utensils you can add on to it are gathered in what is called CRAN (Comprehensive R Archive Network). For some nice 90s nostalgia you can visit the `CRAN website<https://cran.r-project.org/>`_ directly, but we also provide short descriptions of how to Install R on Windows, Install R on Mac OS X, and Install R on Ubuntu below. And for those of you who do not want to run the risk of R withdrawal symptoms: `here's a link to a short description of how to install it on an Android device<https://selbydavid.com/2017/12/29/r-android/>`_. Current versions of R are only available for OS X 10.11 (El Capitan) and above. Since this OS is now five years old, the newer versions should cover most users, but if you are among those running an older version of OS X, you will need to install either R Version 3.3.3 (OS X 10.9 and 10.10) or R Version 3.2.1 (OS X 10.6 to 10.8). All three versions can be `found here<https://cran.r-project.org/bin/macosx/>`_. Prior to installing R on OS X 10.8 or above, you will need to install XQuartz. Simply `download the dmg-file from the XQuartz-Website<https://www.xquartz.org/>`_ and follow the instructions provided in the installer. Afterwards, please restart your computer, before installing R.
To install R after having installed XQuartz, again simply download the `installer provided by CRAN<https://cran.r-project.org/bin/macosx/>`_ and run it. Should you be asked to install XCode during this process, please do so. As was the case with R for Windows, R does not perform automatic updates, so you should check for a new version every three months or so. R can be installed from the repositories for many Linux distributions. We will cover the case for Ubuntu here, but you can find an online tutorial for installing R on RedHat on `this blog<https://blog.sellorm.com/2017/11/11/basic-installation-of-r-on-redhat-linux-7/>`_, for example. if you are running Cosmic Cuttlefish. If you are running a different release, simply replace the bionic or cosmic by the name of your version. which should provide you with the current version. In contrast to installing R on Windows or OS X, this will provide you with automatic updates for R.
## R version 3.5.3 (2019-03-11) -- "Great Truth"
## R is free software and comes with ABSOLUTELY NO WARRANTY. ## You are welcome to redistribute it under certain conditions. ## Type 'license()' or 'licence()' for distribution details. ## R is a collaborative project with many contributors. ## 'citation()' on how to cite R or R packages in publications. ## 'help.start()' for an HTML browser interface to help. ## Type 'q()' to quit R.
R Version obviously states the current version of R you are using, with its release date and nickname. I have tried and tried to figure it out, but, as shared by `MattBagg on Stackoverflow<https://stackoverflow.com/questions/13478375/is-there-any-authoritative-documentation-on-r-release-nicknames>`_, there is apparently no system in the nicknames. free software: we talked about this above - R is free and free, so you may do with it whatever pleases you. When redistributing it, however, you should keep the license in mind. ABSOLUTELY NO WARRANTY: this is the big reason some companies are still hesitant to use R in high-stakes situations. If your results are wrong because there is an error somewhere in the R-package you are using to perform your analysis, there is no one you can (legally) blame, but yourself for not checking the code thoroughly enough. Now keep in mind, that this is very rare, because most researchers publishing R packages do not just throw any half-baked ideas on CRAN, because their reputations are also tied to their work. The idea is simply, if you want to be sure everything is correct, check for yourself. Using the citation() function provides you with an overview and a BibTeX source for citing R. If your analysis was performed in R, please use this function to cite it correctly. The official way to interface with R is either via command line (if you are using OS X or Linux) or using the R GUI (if you are using Windows). Both approaches are very limited in their depiction of information and some might even want to call them ugly. This is why there are multiple frontends you can use for R. For those of you, who are already proficient in Emacs, there is `ESS (Emacs Speaks Statistics)<http://ess.r-project.org/>`_, which allows you to interact not only with R, but with a lot of other statistical programming languages as well. For those who enjoy a more customizable interface, I would highly recommend `Atom<https://atom.io/>`_, which allows you to interface with Python and R in the same environment and comes with integrated git-functionality. `Here is a quick description of how to get both working in Atom<https://jstaf.github.io/2018/03/25/atom-ide.html>`_. However, the most widespread IDE for R is, by far, RStudio. 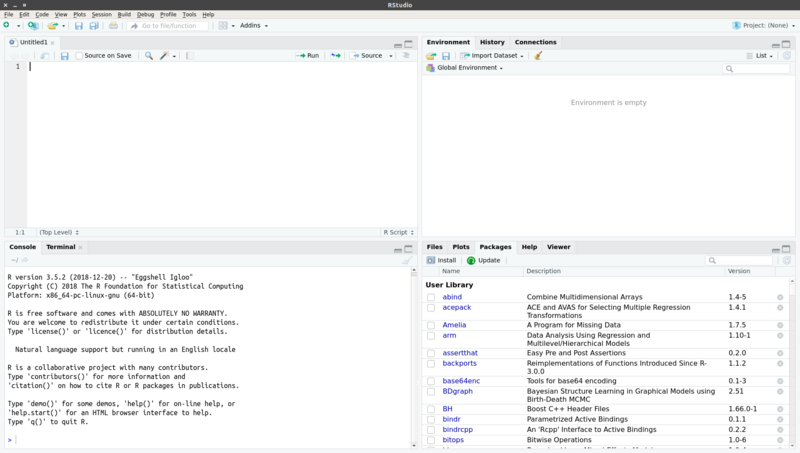 RStudio is a company based in Boston, MA, developing a variety of different products centered around R. Their initial product was the IDE RStudio, which provides a much nicer GUI for R, than the original. The benefit of RStudio over the other possibilities I talked about above is that it is specifically designed for R and all of its little quirks. Thus, it is not a multi-purpose programming tool, but is focused on giving you the easiest and most intuitive way to interact with R, making it a good tool for learning and using R. Beyond that it works identically across all platforms (Windows, OS X, and Linux), making it a good tool for teaching. It also integrates some extensions on R (like R-Markdown for reporting), which we will get into later in this volume. To install RStudio, simply `visit its download page<https://www.rstudio.com/products/rstudio/download/#download>`_ and choose the appropriate version for your system. Be aware, that RStudio is simply a frontend and requires you to have installed R as described in the previous section. In contrast to R, RStudio comes with an integrated possibility of updating - this does not update R, however! So you will still need to check for a new version every three months or so, if you are working on a Windows or OS X machine. Everything we will do in R in the following sections can be done without RStudio, using either just the command-line version of R or any other IDE. Using RStudio is simply a recommendation to ease your way into using R.
RStudio just after opening a new R script. as the result. The layout will be a bit different from what you see on this website: your commands should be preceded by a prompt > and, by default, be in blue, while the result should be in black. Throughout the sections of this volume dealing with R, results will always be preceded by the double hash: ##. These two panes are what you would find in almost any frontend you could use to interact with R. Where RStudio starts to shine is the remaining two. In the top-right you see a pane labeled “Environment”. The other two tabs of this pane are rarely of relevance, so just concentrate on the Environment for now. This pane shows you everything that is currently active in R. We will get into this in a second, but believe me: this makes the first steps in R much easier, because you always have a quick overview of all data you are currently working with. To bottom-right pane has five tabs - all of which are relevant. “Files” gives you the possibility to navigate and open files in R. “Plots” is pretty much self explanatory and we will be generating some nice plots soon. The next tab (the one opened by default) is called “Packages” and gives you an overview of all the extensions for R that are currently installed. You can install new ones and load the ones you have installed from here, but we will be looking at more reproducible way of handling packages in a bit. Perhaps the single most important tab here is the one labeled “Help”. Whenever you want to know how a function works, what it does, or how to interpret its output, the help will be opened here. We have only just started to scrape the surface of what RStudio is and what it can do. If you want some more information on it, the documentation provided by RStudio is great. There are tons of `webinars for specific topics<https://resources.rstudio.com/webinars>`_, there is a `quick overview of how to learn to use RStudio online<https://www.rstudio.com/online-learning/>`_, and best of all, there are `a lot cheat-sheets for RStudio and the packages developed by the RStudio team<https://www.rstudio.com/resources/cheatsheets/>`_. From here on, we will not be focusing on RStudio, but more on the core functionality of R. Feel free to do everything we do in the upcoming sections in RStudio, however. Let’s start out with some basics of R code. Because the goal of using R is to write code that leads to reproducible data analysis and results, there are some things you need to know about the general use of R, which we will combine with some hands-on code writing. So, if you have not opened R yet, it is probably time to do so now. Here the section is titled “Simple calculations” and each type of calculation is described in a short comment. Now, this may be overkill, but you get the point. As you can see, I have always left a space between the numbers and the operations. R does not care about empty space. You can even use indentation to help you organize your code without changing the functionality of your code. Beyond this, you do not need to end lines with any specific character - a simple line break ends a line. It is generally recommended to write R as you would write normal sentences, using appropriate spaces to enhance the readability of your code. If you want a detailed style guide for R code, there are `general recommendations published by Google<https://google.github.io/styleguide/Rguide.xml>`_. 3 == 4   # Equal? 3 != 4   # Unequal? 3 > 4    # Greater than? 3 < 4    # Smaller than? 3 >= 4   # Greater or equal? 3 <= 4   # Smaller or equal? which can be read as “not (3 equals 4)”. Because the parentheses are evaluated first, they return a FALSE and this result is negated by !, leading to the final TRUE. Why would you ever need this? Well, we will see. but the way more akin to how R works in all other instances is by using the sum function. So what does this mean? The function log has two possible arguments: x and base. However, what base = exp(1) tells you, is that there is a default in place for the base-argument. So, if you do not provide a value for this argument, the default is used. In this case \(e\) is defined for the exponential function exp, but not separately. So if you use the log-function, exp(1) is evaluated and passed to log as an argument. This already shows you that functions can be nested in R: the exp-function needs to be evaluated to provide an argument for log, so it must be evaluated first. This leads to the same simple principle you find in equations, which can make complicated R code frustrating to read: nested functions are evaluated from the inside out. There are several ways to avoid this, which we will get to in bit. While we used args to get a quick overview of the arguments for the logarithm in R in the previous section, R actually comes with a very good integrated help system. For any function you know the name of, you can simply use the help function. In most cases, this is opened in a new window or pane, which means you can have the help opened at all times. I would encourage you not to be shy about your usage of help. It is a much better, efficient way of learning R than typing and retyping arguments over and over. If you are using RStudio, Atom, or something similar, there is also often some form of auto-completion to help you with functions and their arguments. If it is too much effort for you to type help(function), you can also use ?function to achieve the same result. Description: Usually a very short overview of what the function does. Usage: The basic structure of the function. This contains all of the arguments you can use. In some cases, like the one you are currently looking at, this may contain multiple functions that are documented together, because they work in the same way. As we discussed above, if an argument is followed by = something, it has a fixed default. If you do not provide a value for that argument, the default is used. Conversely, this also means that any argument not followed by the equals-sign does not have a default an must be provided. Arguments: This shows you a list of all the arguments the function accepts with a brief description of what they do and which format they must adhere to. Details: Additional information you may want. For functions that perform complex analysis, this may contain a detailed description of the procedure with appropriate citations. Values: A list of all the output a function produces. In R results of functions are often much bigger than what is printed, when you use them. The values listed here are all the values that are returned, even though you may not see or interact with them on a regular basis. See Also: If you did not find what you were looking for, maybe these similar functions can help you. Examples: Maybe the most important section. All documentation in R must ship with minimal working examples. Often the list of arguments can be overwhelming, so you may want to scroll to the bottom to look at the examples in order to see the functions in action. What you can do is copy examples and paste them into your R script to execute them. Basically, this is the same as asking the judges to hear the word in sentence when you were contestant in a spelling bee. apropos is function you can use instead of help. Using help requires you to know the exact, specific name of the function you need help with. Most of the time that is not the situation you need help in. Often the actual name of a function eludes you, which is where apropos (or its short version ??) comes into play. should open a list of some possible functions you could have meant. From here, you can navigate the help files of these functions. There is no way around it: mistakes happen. When using R, especially in the learning phases, you will produce code that is incorrect, produces errors, or does not do what you expected it to. It is important to know, that this is nothing to be afraid of. One of the advantages of R is that it is made for people who are not professional programmers, so it is rather forgiving in how mistakes can be handled. Because you can execute R code a line at a time, you can avoid the anxious time spent waiting for your code to compile before punishing you with error messages. Instead, you get an immediate feedback on what you did wrong - always think of this, when you are struggling through countless R errors. On a fundamental level, R has three ways (in addition to just producing correct output) to communicate with you: messages, warnings, and errors. This makes sense if you are running long scripts or writing your own functions and want to produce some output to give you a progress update, for example. ## Warning: I am hungry. This still produces output (NaN, meaning ‘Not a Number’), but tells you that something went awry in a warning message. If you produce a lot of warnings (more than 10, by default) R will simply say something like There were 11 warnings (use warnings() to see them). Then, executing warnings() will give you a detailed output about the warnings you produced. If you really produce a lot of warnings (more than 50, by default) R will stop counting them and only return the first 50 when you invoke warnings(). ## Error in eval(expr, envir, enclos): I am starving. Note that errors are produced using the stop function, not with a function called error. This underlines that the code is stopped at that point. If you are writing a function this means that the execution of the function is aborted at that point and that the error-message you provided is returned. In long scripts this does not mean, that the next line will not be executed, however! Because the next line is a new command, R will simply continue on without having produced the previous results, which can often result in very long chains of errors. The text produced by warnings and errors is written to be useful in all cases, in which they can occur, so it often does not seem all that helpful. However, once you develop a better understanding of the inner workings of R, you will start noticing that they actually tell you exactly what the problem is. but the first version is much more common, because it allows you to see the objects you have created faster. One important thing that just happened, that I want to draw your attention to, is that there was no warning whatsoever. In R objects are simply overwritten if you assign new content to them, so it is best to be very aware of the names for objects that you have already used. This makes it doubly important to use distinctive names for your objects (the other reason being that you want to know what is happening). The `Google Styleguide for R<https://google.github.io/styleguide/Rguide.xml>`_ that I mentioned above also contains some guidelines on how you should name your objects. These are only guidelines, however, and objects can have any name that does not start in a number. uses the object my_num as an argument in the square-root function and then stores the result in a new object called my_root. where you simply provide the entire environment (as produced by ls) as an argument to rm. As you saw in the previous section, objects are where results and numbers are stored. Data you assess is no different, it is only bigger. As discussed in an earlier chapter, variables are the basis of assessing behavior and multiple variables are combined into datasets. R is extremely rarely used to manually input any data. Most of the time it is either imported from a program you used to assess your experimental data (e.g. from Psychopy), downloaded from a provider you used for assessing data online (from Limesurvey, Unipark, or something similar) or transferred from a different source of data storage (e.g. from an Excel-Sheet). Nevertheless, knowing how data can be created in R can be an incredible help to understanding how data is structured, when it comes from somewhere else. One more important thing before we continue. In case you were testing all of the previous commands directly in the console, I would like to remind you that we have a script open. This should be used for writing down and commenting the code from this exercise. Do not forget to regularly save it, as you would any other work in progress. You can copy-paste the commands from the following sections into your script, give them a descriptive comment and execute them right from the editor. Just select the row you would like to execute and hit the Run button. You can also use the Ctrl + Enter shortcut (Cmd + Enter on Macs). The Stroop effect is the difference between the time it takes you to correctly name the color a word is printed in, when the word and text color match versus when they do not (see [MacLeod1991] for an overview over the first 50 years of its existence). If you want to see how it works, you can check your performance in an online version on `Open Cognition Lab<http://opencoglab.org/stroop/>`_, for example. we obtain a bit more detailed information about the structure of the object: it is numeric (num), it contains the elements one through six ([1:6]), and we see a preview of this object, namely its first five elements. As you can see, this produces a warning (see Messages, warnings, and errors) and the resulting vector contains only NA. This is R’s way of encoding the absence of information and is short for not available. This occurs, because R has no idea how to transform the word 'green' into a number. Using the basics of measurement theory that were discussed in an earlier chapter, we know that what R is missing is some form of adequate relation. We will discuss how this is done in Factors, but for now, let us continue with vectors. ##  "blue"   "green"  "purple" "red"
##  "green"  "purple" "blue"   "red"
which is much more useful, because we will rarely have code-book lying next to our screen where we can look up what each number means. Additionally printing a factor returns the possible values, meaning all levels of the factor. Be aware that this makes it possible to have levels of factors, which are not realized in the data. ##  "green"  "purple" "blue"   "purple" "red"    "green"
##  "green"  "blue"   "purple" "red"
the resulting levels are not really helpful. In this case, you can provide new levels to the object. Let’s take a quick look at how this works: there are four levels (1, 2, 3, 4) from the conversion of the numeric vector. These four levels can be provided with new labels (blue, green, purple, red). Thus, it is important that there are actually four levels, which we assign to the levels attribute. We don’t need to assign the values for each observation of the variable, only the unique levels. Now, as I’ve noted, normal factors encode nominal scales. You can also encode ordinal variables with the ordered type. Say we ordered the colors by their wavelengths: purple (with the shortest wavelength), blue, green, red. meaning that ordered is a special case of factor. As you can see, the types are more specialized the further to they are to the top of the table. More specialized types restrict your possibilities of combining arbitrary information, but make storing and handling data more efficient in terms of computational power. Especially when handling abstrusely large data (such as raw fMRI or genetical data), I would highly recommend using matrices. Matrices are especially useful, because you can simply apply matrix-algebra to them, making computation and data analysis much easier. As you can probably tell from the table, a matrix is a special case of an array - the two dimensional one. Less obvious is the fact that :code:`data.frame`s are special cases of :code:`list`s, i.e. the one where all content is of exactly the same length. If we want to combine these two to a matrix, there are multiple ways, but the two main approaches are, by either using the matrix function or by using cbind. We will use the second approach here, but I encourage you to take a look at help(matrix) and try this approach to reconstruct what is happening here. but - because matrices are special cases of arrays - it is also an array! ## [1,] "green"  "green"  "TRUE"  "597"
## [2,] "purple" "purple" "TRUE"  "1146"
## [3,] "blue"   "blue"   "TRUE"  "497"
## [4,] "purple" "green"  "FALSE" "938"
## [5,] "red"    "blue"   "FALSE" "1080"
## [6,] "green"  "red"    "FALSE" "1304"
All vectors were combined, but they were all converted to the most general type of vector of the three: character. This is bad, because you loose the numeric information in the variable react and can not use it for calculations and statistical analysis. The three types discussed so far all assume that the vectors we combine are of the same length. What happens when they are not? Let’s generate a vector with five entries. Because we have not particular data for this example, we can just fill it with a sequence from 1 though 5. In this case the : is a shorthand for seq(1, 5, 1), meaning a sequence is generated from 1 through 5 in steps of 1. With the seq function you can generate all kinds of sequences - feel free to check help(seq). so you will need be careful when adding new variables: always check whether the new data is actually what you intended. The final way of storing data is simultaneously the least efficient and most regularly used form: lists. The latter is the case because most functions return lists as results. For very large data sets I would advise against using list, because they tend to slow everything down quite drastically. In general, if it is at all possible to simplify your data into a data type that is above it in the table I presented at the beginning of this section, you should probably do it. The structure of this looks eerily similar to that of the data.frame we looked at before. That is because, as mentioned, :code:`data.frame`s are simply special lists. The difference is that you can store anything in your list, even other lists! ##  $ : chr "Person 1"
In many cases, the results of functions are rather complicated lists. For example, the result of a regression in R is a list of 13 elements of various types and sizes, so it is useful to know how to interact with lists, even if your own data should ideally be stored in a different format. In the previous two sections the focus was on combining data into larger objects. While this is normally what you do when gathering data, inspecting specific information is just as important, especially because, as noted above, results that are output by analysis functions are often lists. of course, you do not need to create an object for the selection vector, you can pass it directly (i.e. react[c(1, 3, 5)]) and it will have the same effect. This works according to the same principle we discussed in Functions and arguments: functions can be nested in functions and, because they are evaluated from the inside out, their results will be used as the argument. In this case the c function is evaluated and its result (the vector) is passed to the brackets. In case you were wondering: you can also use this to select the same element multiple times. It is possible to select elements in matrices by using a one-dimensional notation: mat will return the seventh overall element, first counting through all rows of the first column, then continuing with second column and so on. However, I would strongly advise you to use the two-dimensional version of selecting data from matrices for now. This is actually the first time we see a function returning a list! The information we can glean from it is that the first dimension (the rows) has NULL names - so no names here. The second dimension (the columns) contains the names color and text. These names were simply inherited from the names of the objects we used cbind on. As we discussed in Combining data, matrices only work in a limited number of situations and data.frame`s are much more widespread. Then why did we just spend so much time on matrices? Well, because a :code:`data.frame is just as two-dimensional as a matrix, so the same procedures we discussed for matrices also work for them. This has the potential to make it much easier to handle subsets of data, when you perform a lot of analyses on certain parts, but not others. This type of selection can be read as “in dat, select variable react”. This is used in extremely many R scripts, because this allows us to store combined data and then quickly pick a single variable for which we want to calculate some statistics. This procedure also works for lists and can even be extended to cases where multiple $ are used in sequence. Say you have multiple data frames in a list. In that situation you can select a variable in a data frame in a list by list_name$data_name$variable_name. However, keep in mind, that for the $ approach to work, all elements you are trying to select must be named! For data.frame`s, R generates names automatically (:code:`V1, V2, and so on, if you do not provide names), but this is not the case for regular lists. ##  "color" "text"  "cong"  "react"
If you are more comfortable with using functions instead of the brackets or the $, you can also use the subset function, which allows you to achieve the same results. If you are interested in seeing how that function works, I encourage you to take a look at help(subset). We have now seen how to combine separate objects to one data set and how to select and extract specific information from those data sets. The last step is to add new information to already existing data. As we have seen above, we can use cbind or rbind to combine multiple vectors either by column or by row. This also works for adding columns and rows to pre-existing matrices. Additionally, we already saw that the data.frame function can be used either to combine vectors into multiple columns of a :cdoe:`data.frame` or to add vectors to existing ones. This is again a vector of 6. We could create an object by using the <-, but that would not add the variable to the data.frame. It would simply become a free floating object in our environment. To keep data organized, it is better to store them together in a single object. As you may have guessed, it doesn’t. This means, we can simply create it by assigning values to it. This works just like it does for creating objects in the environment. If we use a name that does not exist, the variable is created. If we use a name of a variable that exists within the data.frame, it is overwritten without warning. This is especially useful, when you are handling many data sets simultaneously, because it can help you avoid overwriting information you may have needed. Instead a variable is assigned straight to the data.frame it is related to. ##  "color" "text"  "cong"  "react" "dif"   "dif2"
##  "blue"   "green"  "purple" "red"    "orange"
##   "color"      "color_fac"  "color_fac2" "color_num"  "color_ord"
##   "con"        "cong"       "dat"        "dat2"       "five"
##  "inc"        "lst"        "mat"        "meta_list"  "react"
Most of it is junk that we don’t need, but we may want to keep the data frame containing the results of the Stroop trials. In the easiest case you can simply navigate to your folder using your file system and copy its location (listed in its properties). Windows users should be aware: Windows uses backslashes \` to denote subfolders, while R uses forwardslashes :code:/ . So, if you copy the folder location on a Windows machine you will need to replace all the :code: ` with / in your filepaths. to check. In most cases I highly recommend having an additional subfolder called “data” in the folder for your project. Then, you can use ./data/ to save and load from there. Generally speaking, RDA is best suited when you are storing multiple objects simultaneously and you do not need them separately. RDS on the other hand is best suited for use with single objects. Most people use RDA regardless of whether they are storing multiple objects or single objects, but we will look at both, because using RDS can be extremely beneficial when using the same routines multiple times - for example if you have a single data frame for each test subject. So that is all it takes to save and load in R. Let’s take a quick look at the alternative: RDS. Loading an RDS requires you to assign the result to an object. This has the benefit that it allows you to use object names that are specific to the script you are working with to analyze your data, not to the one creating it. In general, I would recommend using RDS whenever possible. You might be wondering: if RDA can save multiple objects at once, why not save the entire environment? This is actually what RStudio asks you to do, when you close it. Don’t. The core idea of using a programming language like R is that you can use the script to recreate everything that was done. Relying on objects in your workspace that you cannot recreate using your script means that your data preparation and analyses cannot be reconstructed by anyone else. Most of the programs used to assess data do not produce RDA or RDS data. Most often what this means is that you will have to import and clean data, then save it as RDA or RDS, and use those files for your analysis scripts. For a quick glance of how to import from the data-formats provided by SPSS, SAS, STATA, and so on, you can take a look at the overview provided on the `Quick-R website<https://www.statmethods.net/input/importingdata.html>`_. In this section we will take a more in-depth look at importing from text-formats, because they are also often what we get from Python-based assessments. The text-formats you will see most often are .csv, .txt, and .dat. While there is a specific function for .csv files (take a look at help(read.csv) if you are interested), the general function read.table can be used for all three types, so it is the best one to discuss here. The experiment that was discussed in the previous sections results in multiple .csv files - one for each participant. We will take a look at how to efficiently extract all of them in just a few lines of code in the next chapter, here we will concentrate on importing one of them. This seems to have done what we wanted. Remember, there is no problem with simply trying things, running your code, to see what happens. As I stated above, it is one of the main benefits of using R: you do not have to compile your code. In this chapter we took a “quick” glance at the basics of R. Starting to get along with R can feel pretty overwhelming at first, but always remember that there is no penalty for trying something and getting it wrong a couple of times. When seeing warnings and errors, don’t panic. Just remember to use help frequently. If you followed along with all the examples in this chapter you should have a general idea of how to use R as a calculator (Commenting and basic functionality) and understand the basic rules of how to use functions (Functions and arguments). You should also know what objects are and how to create them (Objects and the Environment). What we will need in the upcoming sections are basic skills in Handling data, so we can prepare our analyses. In the next chapter, we will dive into some more in-depth concepts of R, but if you want some other sources to broaden your knowledge, I would recommend starting with Hadley Wickhams `Advanced R<http://adv-r.had.co.nz/>`_. If your looking for answers to specific questions, check out `R on stackoverflow<https://stackoverflow.com/questions/tagged/r>`_.